Wholesale Solar carries high quality 4 Star Solar PV Wires, Battery Interconnects, and Battery to Inverter cables. Not sure what you need? Call a Wholesale Solar Tech at 1-800-472-1142 or send us a request via email. All current PV Wires are fitted with MC4 1000v locking connectors and are compatible with almost all solar panels currently manufactured. Not sure if your solar panels work with MC4 connectors? Call a Wholesale Solar Tech at 1-800-472-1142 or send us a request via email. 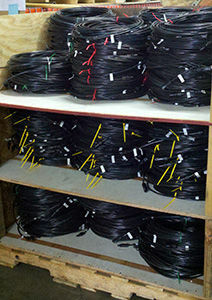 These are PV specific cables that are insulated and jacketed. They are specifically made to be more flame retardant (flame rated VW-1), sunlight resistant, moisture resistant, and crush resistant. These particular photovoltaic cables follow UL Standard 4703 that pass USE and USE-2 and are rated for direct burial through a conduit or raceway. If you're looking for fuses, please visit our fuses page. 9932526 Strain Relief 1/2" Strain Relief w/ 2 Holes, 0.25 to 0.27"